Baytril for Dogs Dosage - What Is The Right Amount? Baytril for Dogs Dosage – What Is The Right Amount? What is the proper Baytril for dogs dosage? As a pet owner you need to know this if your vet prescribes Baytril for your dog. The first consideration for dogs is the form of the medication, because this drug comes in tablets and ear drops for canines. The possible Baytril side effects will also depend on the form of the drug used. 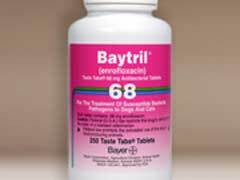 For the tablets the usual dose of Baytril for dogs is anywhere from 2.27 mg to 9.07 mg per pound of body weight given once a day, or half of this amount given two times per day at twelve hour intervals. Doxycycline for dogs is another antibiotic that may be prescribed to treat infections, but some dogs may not be able to take this medication for a number of reasons. If your vet decides that Baytril for dogs is right for your pet, then the dosage will be carefully calculated by the vet. The severity of the infection will determine the dosage as well, and so will any other medical conditions that your pet may have. Certain medications, such as Furosemide for dogs as well as many others, may affect how the drug works in your pet. Make sure your vet is aware of any other medical conditions or medications that affect your pet before this medicine is prescribed. If your dog has an ear yeast infection or other type of ear infection then you will need to place drops in the ear. A usual dose is from five to ten drops in the ear, to be administered two times a day. Baytril for dogs in a form of ear drops should be used for the entire course of treatment, which can range from ten to fourteen days depending on how severe the infection is. A urinary tract infection in dogs must be treated with tablets, and the drops can not be used unless an ear infection is being treated.